I am the owner of Secure Property Management. I have been established and working in St Lucie and Martin Counties for approximately 17 years as a property Manager. Last year I was referred to Royal Green Landscape & Pest Management by a fellow property manager that has been working with them for years; she had nothing but great things to say about them. I met Royal Green’s Sales Manager Jason Tyrrell at one of my properties. I was impressed by his experience and knowledge of horticulture. He proceeded to give me a thorough evaluation of each of my communities. Since contracting Royal Green for my communities, The Village in Stuart and the Fountains of St. Lucie in Port St. Lucie, I have been very impressed with their staff’s knowledge, science based program and the results. They have cleared up many nutrient deficiencies; I had many sick palms. My turf is greener than ever and weeds are under control. I had several insect issues on my ornamentals that they addressed immediately. When there are issues, they keep me informed; I do not have to micromanage them, I know they are on top of things and will take care of my properties proactively. Royal Green has exceeded my expectations set by the many other companies I have worked with as a property manager over the years. Royal Green has the skill set, qualifications, accomplishments, integrity and the drive needed to bring any communities landscape to its potential. 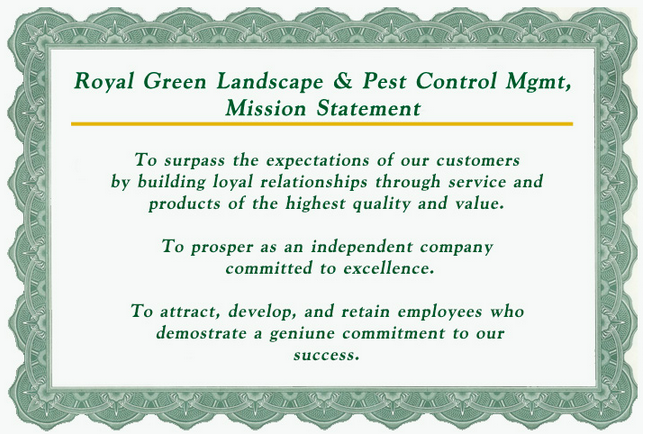 I am pleased to recommend Royal Green Landscape & Pest Management. Royal Green Landscape has been the contractor treating our landscaping and shrubs for about two years and have been doing an excellent job. They are responsible for all of the weed control, insect control and fertilization of our facility which contains 700 individual homes. In the past we have had six different contractors doing this work over the last 10 years and were not satisfied until we hired Royal Green. The lawns and shrubs have never looked as good as they do now and that makes 700 homeowners very happy. They are very efficient in their work and are in and out with no distractions to the homeowners which is a very good thing for the HOA since we are self managed. I would recommend Royal Green Landscape, without reservation, for the treatment that they do for us. I would like to highly recommend Dave Harper of Royal Green as the “ideal” vendor for a community to work with. Not only does Dave himself go over and above, but his complete staff from the receptionist to the spray techinicians has your needs utmost on their minds. I have used Dave in the capacity of a property manager and also as a Board Member with the self-managed community where I live. In both instances, the property was a complete turnaround in results. Communication is not lacking nor is education. I have learned so much from him and use these tools in my profession. I will say that Royal Green may not be the least expensive in the bidding process, however, the saying “you get what you pay for” is so true. The visible effects transformed both of my communities. I do not know what I would have done without him and his team. I do not think you will be disappointed. “A lot of local men start a business with nothing more than a pick-up truck and an idea. But few are still in business 22 years later and even fewer have a truck fleet 15 times as large. David Harper is one of those few. Harper is president of Royal Green Landscape & Pest Management, a Jensen Beach-based company serving more than 3,000 homeowners in Martin and St. Lucie counties. Royal Green has a lengthy roster of services to meet whatever need a homeowner has for lawn and landscape treatment as well as for interior pest control. The focus is on improving landscape health and protecting homeowners health inside the home. Harper is so confident in the effectiveness of their treatment programs that he guarantees the fertilizer and pest control programs will meet turf and landscape needs. Even the interior pest control and rodent control service is guaranteed, Harper said. The Royal Green lawn program includes slow-release fertilizers with micronutrients, insect control, weed controls and disease controls. The tree and shrub program consists of balanced fertilizers, micronutrients, insecticides, miticides and fungicides with treatment specifically offered for plants and citrus. “My technicians, staff and I enjoy watching out new customer’s landscape transform from ugly over to the envy of their neighbors,” Harper said. The business has grown because of customer retention and referrals. Diane Frazier, president of Secure Property Management, said that Royal Green’s treatment of palms and lawns had done wonders at planned communities in Stuart and Port St. Lucie. Frazier credited Royal Green with keeping her informed about treatment issues, relieving her of micromanagement concerns. “I know they are on top of the things and will take care of my properties proactively”, she said. Marvin Ott, president of the St. James Golf Club HOA in St. Lucie County, wrote to Harper that the bud’s 700 homeowners are very happy with their service after six previous companies failed to do the job. “The lawns and shrubs have never looked as good as they do now”, Ott said.